Think of the civil rights era, and a few images may come to mind. The photograph of Emmett Till lying mangled in a casket in 1955, after he was lynched in Mississippi at age 14. News footage of the riots of the late 1960s in Milwaukee, Detroit, Washington D.C., and other major cities, in response to Martin Luther King Jr.’s death and the desperate conditions of American inner-city neighborhoods. The Pulitzer Prize-winning photo of a grieving Coretta Scott King at the funeral of her husband in 1968, their daughter Bernice slumped in her arms. They are scenes of grief and pain and violence — the toll of the fight for justice and equality. Yet in the art created in that period, there’s so much more. Not just the loss and pain, but also the energy and pride of a time when rallying cries for Black Power intensified. An exhibit currently on show at The Broad museum in Los Angeles aims to greatly expand the canon of artwork made in those years. “Soul of a Nation: Art in the Age of Black Power 1963-1983” features more than 60 black artists who illuminated that incendiary era with electrifying works — some previously unknown — including paintings, murals, collages, street photography, even prints made from a greased body pressed into paper, and sculptures made of human hair. The exhibit devotes an entire room to black heroes, including an oil painting of Black Panther Party co-founder Bobby Seale depicted in a Superman T-shirt, and activist Angela Davis painted in bright colors, with the words of her speeches radiating from her face. “Soul of a Nation” opened at the Tate Modern in London in 2017, and is now on a U.S. tour. Before the Broad, it stopped at the Crystal Bridges Museum in Bentonville, Arkansas, and the Brooklyn Museum in New York. It will travel to de Young Museum in San Francisco next. Some of the works do depict violence. But more often, the work exudes power and unity and light, as in Norman Lewis’ abstract painting “Processional,” which features white brushstrokes cutting through the darkness to evoke the marches led from Selma, Alabama, to the state Capitol to register black voters. 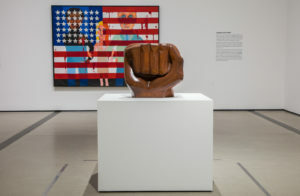 Or Elizabeth Catlett’s cedar sculpture, “Black Unity,” which from one side appears to be two faces, but from the other side reveals a raised fist, a sign of Black Power and solidarity. 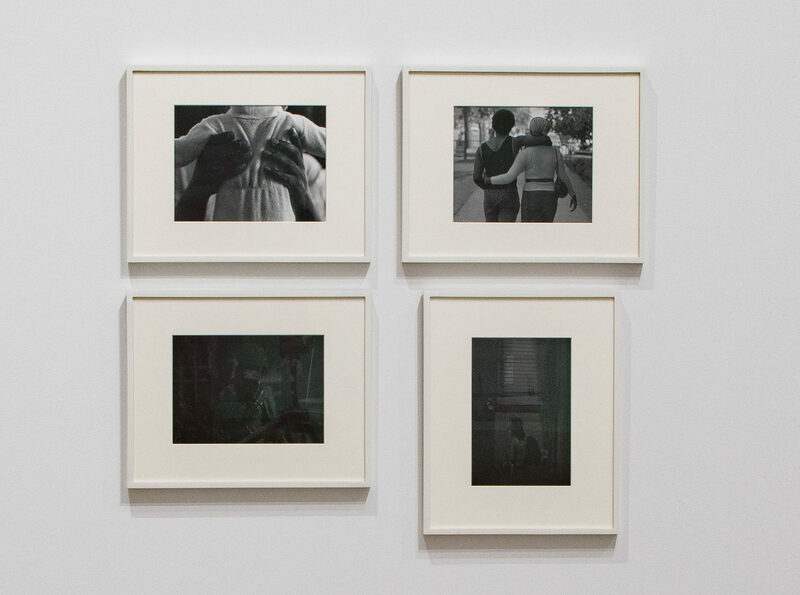 At a recent talk at The Broad, Tate Modern curator Zoé Whitley said that, in the art, “there’s a sense of wanting to crack open the irreducibility of blackness.” The black artists and collectives working in that period, she said, gave no single answer about what it meant to be black in America or what the artist’s role was meant to be. Artist and activist Dana Chandler gave one answer in his 1970 piece, “Fred Hampton’s Door,” a protest piece he created from a real door riddled with real bullet holes to memorialize and protest the death of Fred Hampton, a young Black Panther leader killed by Chicago police the year before. 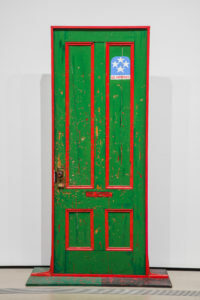 The original painting is gone, but a recreation Chandler made in 1974 — this time with a real door — is on display in “Soul of a Nation.” At the recent talk at The Broad, Chandler said he was glad to see black artists finally headlining mainstream museums, albeit decades after their works were made. “White people control our narrative. White people choose and control and publish our narrative. And now it’s time to turn it around,” Chandler said. Whitley said that many visitors to “Soul of a Nation” have expressed gratitude for the art or anger that the art wasn’t taught in schools. “All the reactions have been so personal,” she said. Steve Williams, a Los Angeles-based filmmaker who came to the exhibit at The Broad, said he believes that images that showed the hurt of black America during this time were privileged over others. “They only wanted to show pain, suffering. Not what we were doing. Like James Brown’s ‘Say It Loud,’” said Williams, citing the funk anthem that calls for pride and empowerment. Sheila Jackson, a writer and producer who went to the exhibit with Williams, said that she remembers a visit to The Getty Museum in Los Angeles in which the only art piece she could find depicting a black person was a bust of a slave. To her, The Broad’s exhibit — where Melvin Edwards’ curtain of barbed wire and chains is hung across from a shimmering Frank Bowling painting in bright oranges and pinks — felt like a breakthrough. Editor’s note: Due to an editing error, it was incorrectly stated that the exhibit would travel to SFMOMA; it will be shown in San Francisco at the de Young Museum.